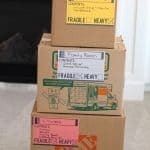 These Cricut Print then Cut Moving Box Labels will help you stay organized during the moving process! You can make them any size you want and color code each room! This is a sponsored conversation written by me on behalf of Cricut. The opinions and text are all mine. 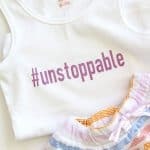 Here are 25 fun sayings that are perfect for any Little Girls’ T-Shirt! Learn how to make them using the Cricut Wild Rose Bundle and Natalie Malan Patterned Iron On! This is a sponsored conversation written by me on behalf of Cricut. The opinions and text are all mine. Come learn How to Use the Print then Cut Feature in Cricut’s Design Space program! 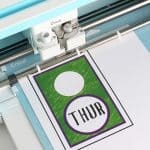 This feature opens up a whole new creative world for Cricut users and is highly under used! This is a sponsored conversation written by me on behalf of Cricut. The opinions and text are all mine. 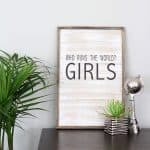 Come learn how to make this super cute Who Runs the World DIY Wood Sign using your Cricut machine and vinyl! This would be perfect in a girl heavy house, a women’s office or girls bedroom! This is a sponsored conversation written by me on behalf of Cricut. The opinions and text are all mine. 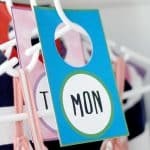 These Laundry Room Organization Labels are a super easy to way to make your laundry room more functional, as well as cute! 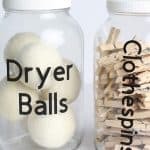 I’m sharing tutorials for a Laundry Sorter and Laundry Containers! This is a sponsored conversation written by me on behalf of Cricut. The opinions and text are all mine. 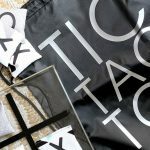 Make this easy Tic Tac Toe Game using your Cricut Maker in about an hour! This game is perfect for indoors or outdoors and hours of fun! This is a sponsored conversation written by me on behalf of Cricut. The opinions and text are all mine.